Get introduced to the world of CSS and get setup so you are ready to begin styling your HTML documents. 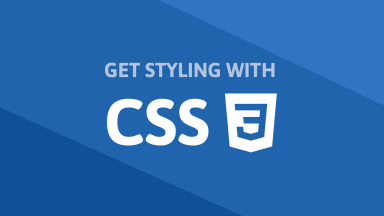 Learn the many different ways in which you can apply CSS styles to your HTML, including with external, internal and inline styles. Selectors, Properties and Values are the core pillars of CSS and this lesson breaks it down for you. Life isn't black and white, and your pages shouldn't be either. Learn how to add some color in this tutorial! CSS offers many ways to change the look and feel of text. Learn how to do so in this lesson on fonts and text. Adding background colors and images is a great way to improve the way a page looks. Learn how to do that in this lesson! Filters are a simple yet powerful tool at your disposal to apply awesome visual effects on elements. The CSS Box Model is an important concept to understand and in this lesson you will learn about margin, padding, and border. Learn how to improve your CSS by grouping selectors together and nesting selectors wherever possible. Learn how to extend both the functionality and look of your page with Psuedo-Classes and Pseudo-Elements. CSS variables allow you to change entire styles on a fly, giving you native and dynamic styles not possible before. Learn about the Display CSS property to know how to control how your elements are rendered on the page. The Flexible Box layout makes it easier to build a responsive and flexible layout for your page no matter the screen size. The Grid CSS property gives you a powerful way to natively create a grid layout for your page to follow. Knowing how to position elements on your page is very important. Learn how to position elements in this lesson. The float property specifies whether an element should be placed to the left or right of its container. Columns are popular in print media like newspapers and magazines, and CSS makes it easy to use your own. Learn the many techniques you can use to properly layout your elements on the page including using flexbox and grid. Use at-rules to extend the functionality of your CSS and target your styles using Media Queries, which are the basis for responsive design. Learn how to natively animate and transition between one state to another in this lesson on CSS Transitions! CSS animations allow you to natively animate properties of an element with ease to create awesome effects. Learn how to natively manipulate and distort the elements on your page in 2D using CSS 2D transforms. Learn how to natively manipulate and distort the elements on your page in 3D using CSS 3D transforms. This lesson is the conclusion and wrap up of this class on CSS! Congratulations on completing the class!